California’s monopoly utilities failed in what many perceive as their latest attempt to squash community choice aggregates. Assemblyman Steven Bradford could not find a senator willing to sponsor his controversial bill, so it expired when the legislature’s current session ended, at 3 am on Saturday morning. California’s “Monopoly Protection Act,” AB 2145, is dead. In 2010, Pacific Gas and Electric (PG&E) spent close to $46 million of its ratepayer’s dollars promoting Proposition 16. Had that proposition been passed, communities would not have been able to form their own utilities unless 2/3 of the residents agreed. That did not end the attempt to hinder CCAs. 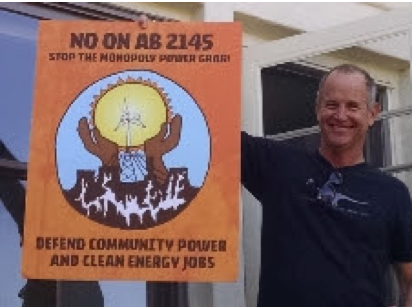 Steven Bradford, the author of AB 2145, is a former executive from Southern California Edison. AB 2145 was passed by the state Assembly, then moved on to the Senate. Both Marin Clean Energy and Sonoma Clean Power agreed to withdraw their objection to AB 2145 if the “opt in” clause was dropped. One of them would have prohibited CCAs from consisting of more than three counties. “We don’t want the utilities imposing geographic restrictions,” said Woody Hastings, of the Climate Protection Campaign. Another provision was that investor owned utilities (IOU) could complain about CCAs to the California Public Utilities Commission. “Can you imagine how many times the CCAs would be yanked into Sacramento or San Francisco to hear a complaint by an IOU,” Sharman said. The Sierra Club withdrew its objection around 30 days before the session ended, saying they could see no environmental issues. A statewide coalition called “California For Energy Choice” refused to budge. 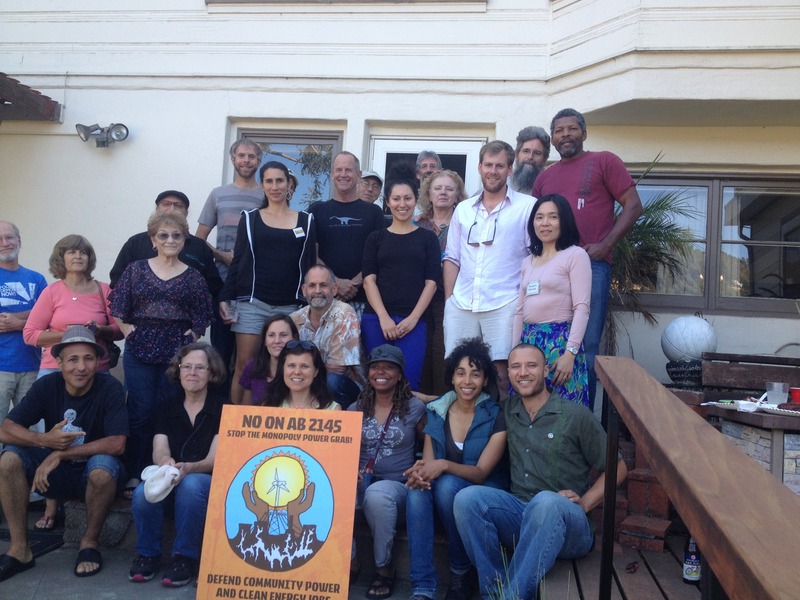 They came from governments, businesses and clean energy advocates in places ranging from San Diego to Del Norte County. AB 2145 fell apart when Bradford attempted to recruit a senator to bring the bill forward for a vote in the senate. “The monopoly utilities made a huge mistake when they forced us to create a coordinated statewide coalition to fight AB 2145. We have now educated thousands of people and legislators to the fact that Community Choice is the state’s most powerful tool to give communities local control over electricity supply, and rapidly build clean energy programs that will put Californians back to work, and combat the climate crisis. We can now use this new coalition to change the game on energy in California,” said Margaret Okuzumi, a key member of Californians for Energy Choice from Sunnyvale. Sharman pointed to another piece of legislation that should be removed. Every bill that Marin or Sonoma send out has a fee that customers have to pay to PG&E for having decided to get their power from another company. Under the present legislation, California’s utilities will be able to charge this parting charge indifference adjustment (PCIA), or exit fee, to every customer who uses a CCA as their utility. Does Sharman think the utilities will try to suppress CCA’s again?